Welcome to ComingSoon.net’s look at all the top titles arriving this week on Blu-ray, DVD and Digital HD. Check out the gallery viewer below for a look at the major new releases, catalogue films and television collections hitting shelves and/or VOD beginning Tuesday, December 20, 2016. With Christmas less than a week away, it’s a quieter week than most for home entertainment releases. Still, there are more than a few great titles and we’re kicking the week off with exclusive clips from both Rob Zombie‘s 31 and from Antoine Fuqua’s The Magnificent Seven. Take behind-the-scenes looks at the special features on both titles in the players below! 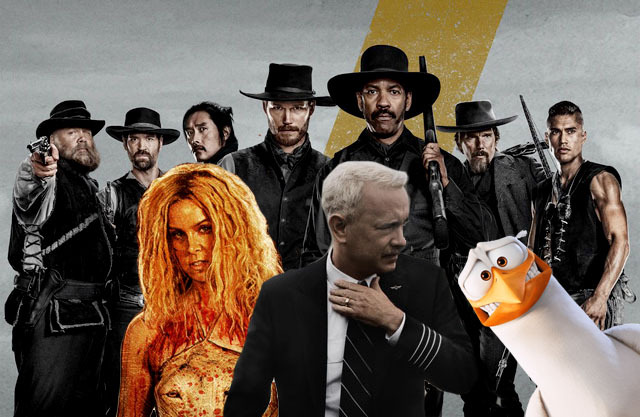 Other recent big screen releases coming home December 20 include two very different high-flying adventures from Warner Bros. Look for both the animated Storks and, from director Clint Eastwood, the recent biopic Sully, starring Tom Hanks. Hitting DVD only December 20 is D.J. Caruso’s supernatural tale of terror, The Disappointments Room, and director Andrew Neel’s similarly-terrifying look at fraternity life, Goat. Arrow has a real treat for Clive Barker fans with Hellraiser: The Scarlet Box, a definitive set that contains the first three Hellraiser films and an incredible amount of bonus content. The only major small screen title arriving December 20 is, on DVD only, NBC‘s recent telefilm musical, Hairspray Live. Digital HD releases arriving December 20 include Nate Parker‘s acclaimed Nat Turner biopic Birth of a Nation, Jocelyn Moorhouse’s Australian drama The Dressmaker (starring Kate Winslet) and the family comedy Middle School: The Worst Years of My Life. Finally, there’s Peter Berg‘s harrowing true disaster tale Deepwater Horizon, starring Mark Wahlberg. As a special promotion, Lionsgate is offering a free Deepwater Horizon VR app. You can grab it at the Apple App Store or on Google Play. You can check out cover art for all the December 20 releases in the gallery viewer below alongside a listing of each release’s special features (where applicable).